Pasta. Who doesn’t love it? 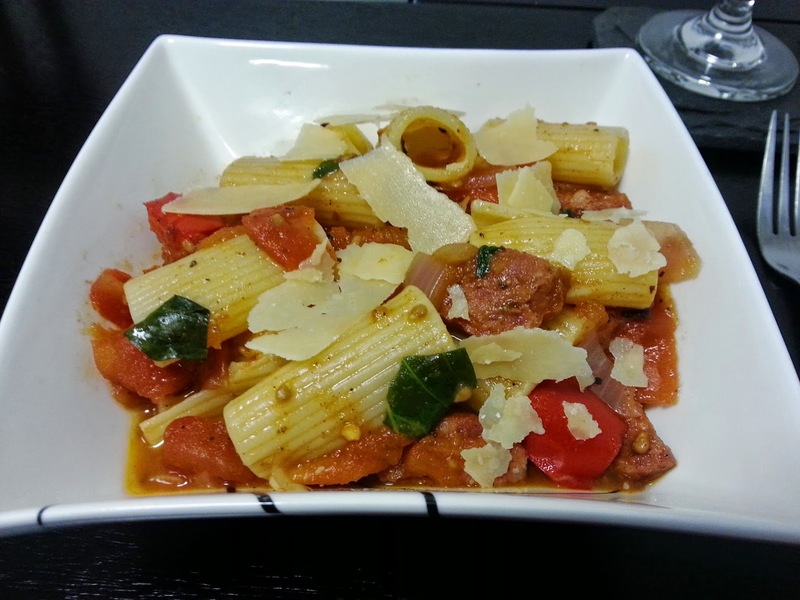 Here is a tasty and simple pasta sauce made from scratch. I have made an alternative vegetarian creamy version of this recipe for years, which I will link here when I make it again for this site. I decided to add meat to use up some ingredients in the freezer and try out some different flavours. This turned out to be a tasty and simple meal worth sharing. The basic pasta sauce is so simple and versatile. There is nothing naughty about it. The only potential naughtiness is in what you add to it. In this case leftover chorizo from the freezer from Spanish Eggs. It was pretty cheap, given that I already had pasta, and only needed to purchase tomatoes, a capsicum, some basil, a red onion and some parmesan cheese. Once we have our herb garden we won’t need to purchase fresh herbs any more which will keep costs down even lower 🙂 But that will be a few more months away. I’ll post about it when it happens. This recipe can become literally any flavour that you like. My original recipe included roasted tomato, capsicum, garlic, oregano and basil , then once I removed it from the oven I stirred through some low fat sour cream (occasionally I added bacon). In this instance I chose to go for the Middle Eastern spice mix + chili + basil (odd mix but it worked). You could stick with Italian herbs, you could Mexican it up with cumin and coriander seeds, you could add smoked paprika instead, you could add a bit of curry paste in if you wanted. 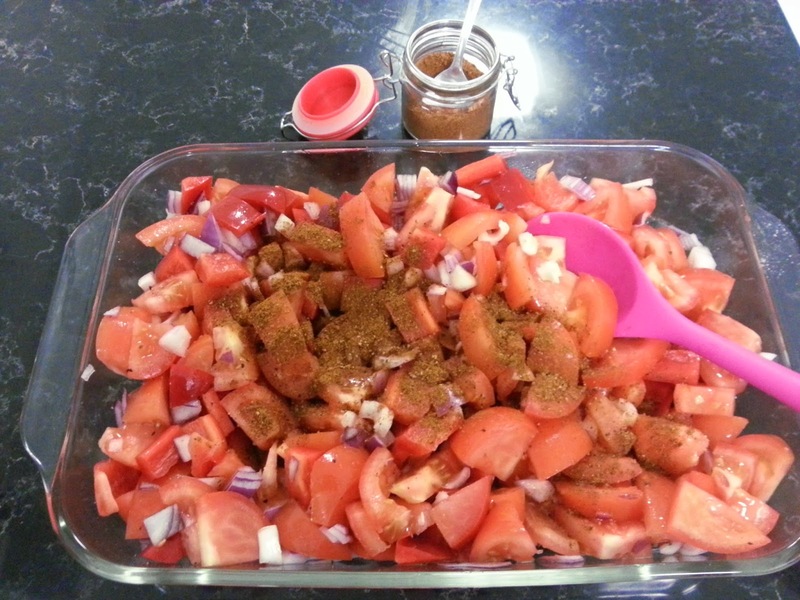 You could add some tomato paste to intensify the tomato flavour. You could use cherry tomatoes instead of normal ones, leave out the onion, or really go to town and roast the capsicums properly by doing them separately then peeling off the skin. You could add it to mince or other meats. You could serve this over gnocchi. You could even leave out the carbs entirely and serve this sauce (minus the chorizo) over fish, a steak or a baked chicken breast with a side of veggies or salad. I could go on. 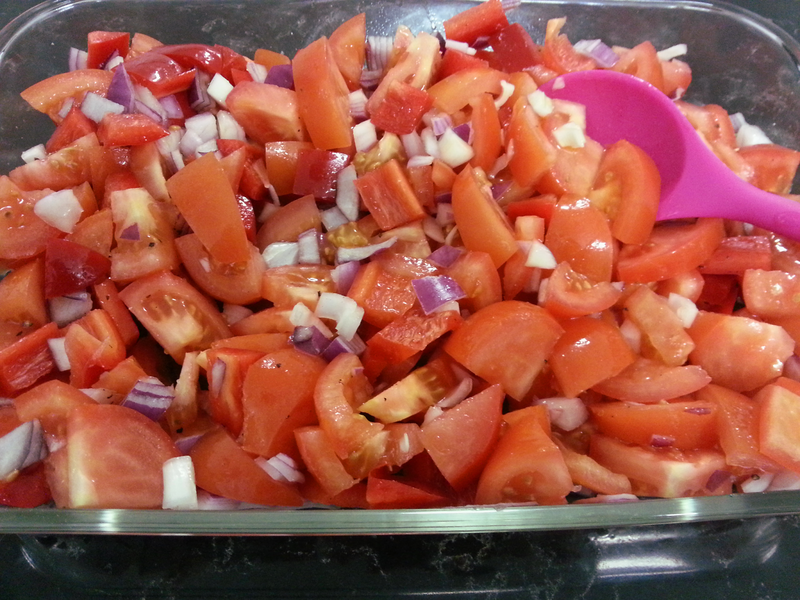 Chop tomatoes, capsicum, red onion, garlic. Add to casserole dish. Pour a thin layer of olive oil over the top, then add any dried herbs/spices and stir through. If you’re not into baharat, then just add italian herbs. Close to the end of cook time, fry chorizo (no need to add oil) and drain the chorizo on a plate with paper towel above and below to soak up any excess fat. Cook pasta in salted water. I have heard that “unless the water tastes like seawater, you haven’t salted enough”. Remove sauce from oven. You may choose to blend it at this stage, but we chose to keep it chunky. Stir pasta, chorizo, chilli flakes and chopped fresh basil through. Enjoy! As usual, it was tasty. The baharat gave it a sweet, rich flavour which matched well with the chorizo. The chili made it spicy. I think olives could have been a nice addition to this meal, upon reflection. The dish is so versatile, so I will post some variations to it over time. This recipe did make quite a lot which suited our budget. On the 2nd night we figured out how to make this a three night meal rather than a two night meal and to appropriately portion size as well without feeling hungry or like we were missing out. 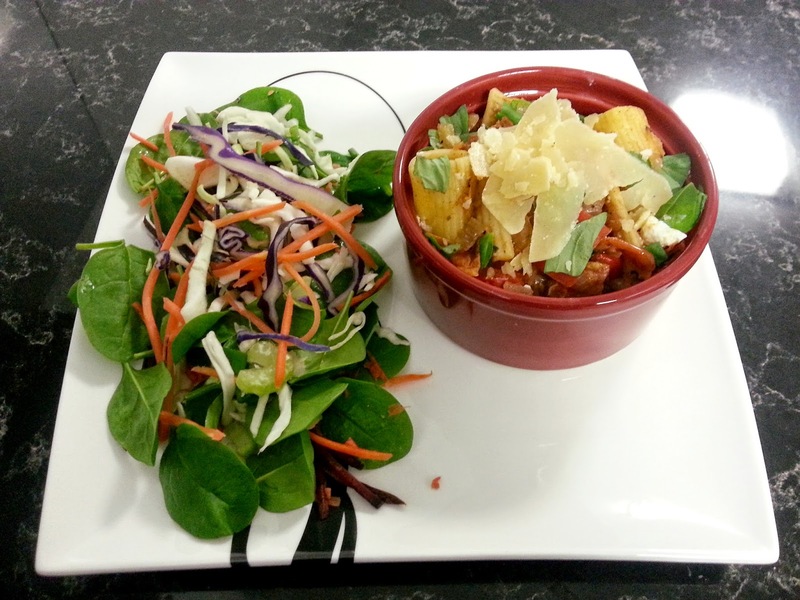 Reheat in small bowls (we used the casuelas from our Spanish Eggs meal) with side salad. Tip: eat the salad first or you won’t eat it afterwards 😉 Our (not so fancy but reasonably tasty) salad was spinach from a bag topped with undressed coleslaw from a bag and fat free french dressing. This was our dinner tonight and will be again tomorrow night. Better for the waistline than the original serving. If we served it like this from the start, it would have made four nights worth of meals for two – economical!!! How would you use this base sauce in your own kitchen?